Christian tradition includes the Apostle’s Creed and the Nicene Creek, which are statements of faith. Both were written in the fourth century after there was an organized structure to the Church, which needed to refute heresies. Earlier, faith was solely a matter of experience. The Disciples, who had earlier abandoned Jesus, had an experience at the Pentecost that inspired them to spread the Gospel. The first Christians heard stories about Jesus, and the experience changed their lives. In today’s world, experiences continue to be an important part of Christian faith, because it is only by our senses that we can receive the revelation of God that transforms us. Indeed, we have received the same stories as the first Christians, and these have the potential to similarly transform our lives. Belief that God has worked through Jesus Christ and that God continues to work through the Holy Spirit means that we profess a faith in divine action within the world, the same divine action revealed in the Bible’s stories. There are people, however, who find the Bible not an inspiration but rather a stumbling block to faith. For example, many conclude that there are numerous inconsistencies and contradictions, and there are stories (e.g., the creation account) that seem to contradict scientific discoveries. For these people, believing in the Bible is tantamount to believing in impossible things. In addition, they are confused by the notion that the Bible is the “word of God,” because words have different meanings to different people and at different points in time. Even if God did “write” the Bible, they posit, the task of discerning God’s mind strikes them as insurmountable. Finally, many readers are troubled by stories that seem to describe God favoring war, mass slaughter, and mistreatment of women, slaves, and animals. I think that, despite these challenges for some people, the belief that God works within history, a belief that appears to be universal among Christians, can make it possible for them to believe that God’s work did inspire the Bible. On this basis they may regard the Bible as the literal word of God. Then, passages which seem inconsistent with a loving God, taken in the larger context of God's plan made before the beginning of the world for Creation, can be better understood. For example, passages that seem to denigrate women or other people, or that picture violence and destructiveness, can be received as part of the Bible's gradual revelation that “God is light and in him is no darkness at all.” (1 John 1:5) Therefore, I don’t think the Bible has to be a stumbling block to Christian faith. One does not need to believe that the Bible’s stories are literally true in order to believe that they are true. Many who doubt the literal truth of the Bible still find its stories profoundly revealing, in the same way that a fictional story can describe important and valid aspects of human experience through fabricated people and events. I think the Bible offers God's truth about human psychology, anthropology, and community; I think those who doubt the Bible’s literal truth can reasonably conclude that the Bible informs us about the will of God. Though, as is often the case, those who hold the Bible as the inerrant word of God and those who receive the Bible as true but not literally true have trouble communicating with each other, this difficulty is not insurmountable. If we focus on Christ as purely loving and forgiving, all Christians, striving to live in love like Christ, have a common ground for living together in a faith community. A good example of Christian scapegoating is the Church's sad history of animal mistreatment. 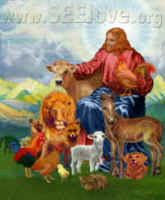 The Christian community has generally interpreted certain passages, such as the dominion over creation granted by God to Adam in Genesis 1, as justifying humankind’s exploitation and abuse of animals. Such an interpretation denies the experience of the risen Christ who gave his life in love for all creation. (Colossians 1:20) Certainly when we believe in the statements of our historic creeds and in the Bible’s historical inerrancy we mean to affirm the experiences of Jesus Christ, both on earth and after the Resurrection. Yet these approaches to faith for most Christian individuals and for the Church has been a kind of rote reciting of creeds and Bible verses which has kept us from the Bible's deeper truth about victimization. Any one of our faith practices which has potential to blind us to the reality of victimization, human or animal, also has the potential to deny the risen Christ's experience. All expressions of our faith must be combined with copious prayers for insight into the kind of community God is bringing into being and our part in bringing it. Next week, we will examine living out one’s faith. I thank Rev. Linda McDaniel for helpful comments on this essay.